Medaesthetics was one of the first clinics in Perth to offer the Fat Dissolving Injection treatment for treating Duble chins. Over the past few years, we have successfully treated hundreds of patients with high patient satisfaction rate. 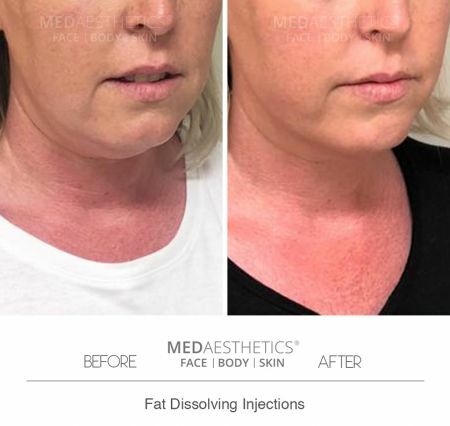 The injection contains a naturally occurring molecule which selectively melts away the fat cells, leaving other cells in the area unharmed. When choosing your treatment provider, it is critical to choose the clinic with an experienced and fully qualified team. 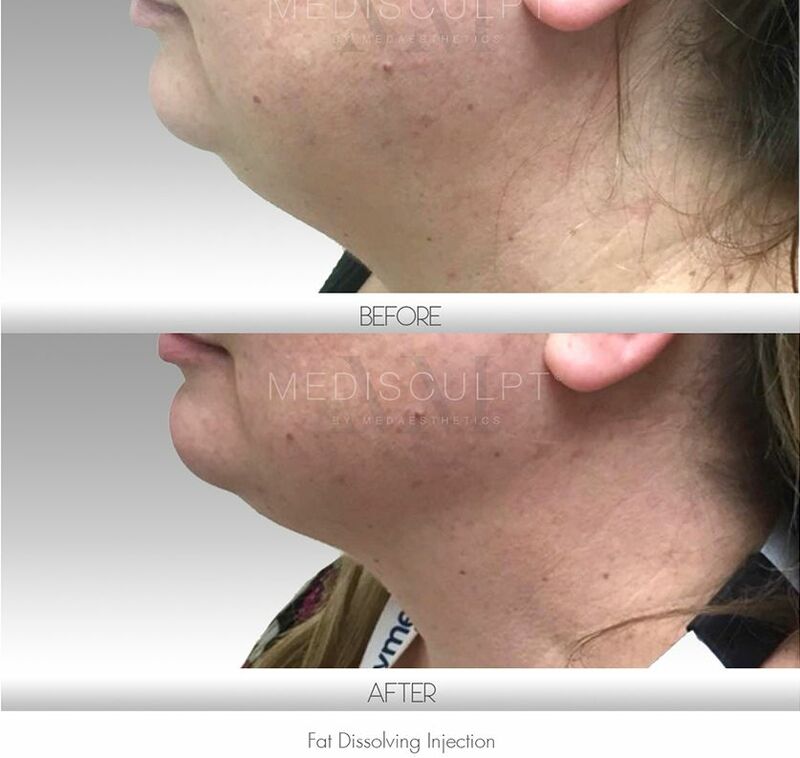 Any adult male or female with excess fat deposits under the chin may consider having this treatment done. This treatment is not meant to correct loose neck skin and patients with a lot of loose skin may not be suitable candidates. Is it safe to have this treatment? The key ingredient of Fat Dissolving Injections is a naturally occurring enzyme in humans, secreted by Gall Bladder. 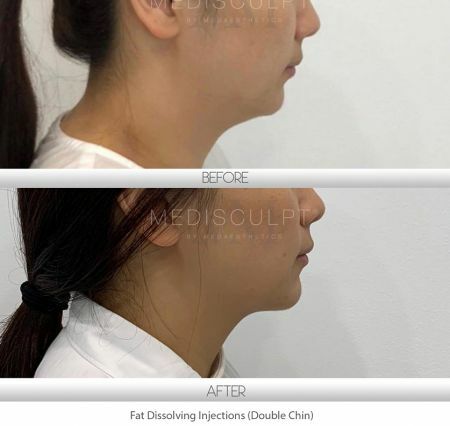 This enzyme breaks fatty tissues and is a very safe and biocompatible product to reduce double chin fat when used correctly by a qualified medical practitioner. There are some rare side effects which are not permanent and will be discussed with you by our clinical staff at the time of your consultation. The area to be treated is first anaesthetised using topical numbing cream and local anesthetic. Once entirely numb, a tiny needle is used to inject small quantities of the product into the fat under the skin. The whole treatment itself takes about 15 minutes. Most patients tolerate the procedure reasonably well. Some patients have reported of feeling mild stinging sensation, but it’s over very quickly. Some patients experience mild to moderate degree of tenderness/ discomfort and swelling in the treated area for a few days after the treatment. We recommend oral painkillers such as Panadol and ice packs to manage this. Most patients experience varying degree of swelling and bruising in the treated area. This can last for up to 5 days. Icing the treated area helps reduce the swelling quickly. Most patients see a visible improvement in the treated area 2 to 3 weeks after the first treatment. A second or third treatment session may be required if more dramatic improvement is desired. Results are permanent. Yes. Patients can drive home or back to work right after the treatment. However, we recommend taking rest of the day off work since there is usually visible swelling after the procedure which subsides gradually over the next few days. One treatment session is $1250 and 2 treatment sessions cost $2400.